The OSBOT Tail is the brainchild of the folks over at Remo Technology, where it will offer AI features that track and record you without the need for a camera man. This will happen regardless of what kind of physical activity you are involved in, be it dancing a number to your favorite tunes, performing stunts on the skateboard at the local park or even while vlogging. With the OSBOT Tail, you will use gestures in order to activate its AI filming modes. Alternatively, one can always settle for the OBSBOT Studio app in order to create a mix of filming effects, and these will include filming your upper body, automatically panning and tilting the video, while automatically zooming in and out for effect, among others. 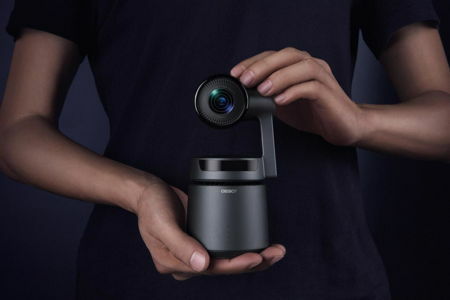 The OSBOT Tail is powered by a HiSilicon Hi3559A chip that enables image processing and supports 3D Lookup Table (3DLUT) for true-to-color footage, snapping 12MP photos as well as capturing 4K video without missing a beat. There is a 3.5x optical zoom lens that works alongside 10 optical lenses (4 Hoya aspherical lenses), while the three-axis, 360-degree gimbal delivers proprietary ‘ExtraSmooth’ technology that provides jitter-free camera movements. It might sound rather expensive at first glance, but most people will be pleasantly surprised to hear that the OSBOT Tail is available for pre-order on Kickstarter for just $469 apiece. Do take note that this is the early bird price, of course. Make sure your home movies will never be the same again with the addition of the OSBOT Tail to your filmmaking arsenal.